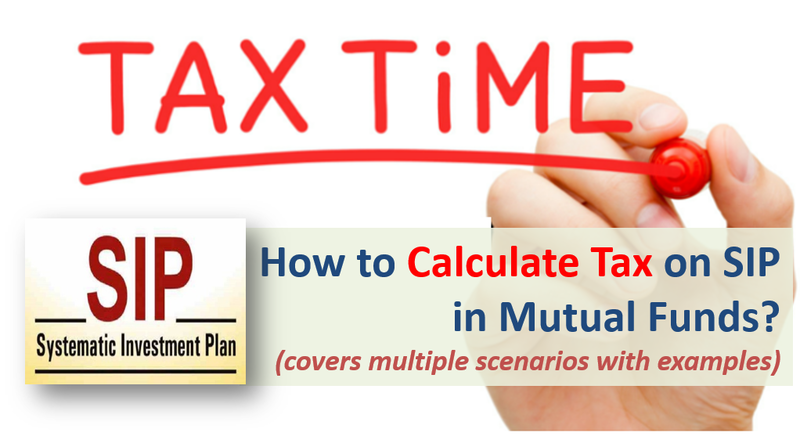 How to Calculate Tax on SIP in Mutual Funds? SIP or Systematic Invest Plan in Mutual Funds have become quite popular among investors. However, most people are not clear about how their SIP would be taxed on redemption. To answer the taxation aspect, we need to understand what SIP is? Suppose I have invested in IDFC Premier Equity Direct-G using SIP of Rs 5,000 from January to December 2016 on 1st of every month (total 12 installments). Now we take different scenarios and calculate Long Term and Short-Term Capital Gains/Loss. Just to reinstate, for equity funds gains/losses from units sold after 1 year of investment is classified as long-term capital gains/losses while units sold with-in 1 year of investment is short-term capital gains/losses. I sell all units on June 2, 2017. What would be my Long Term and Short-Term Capital Gains/Loss? All SIP installments between January 1 to June 1, 2016 have completed at least 1 year of investment, so would qualify for Long Term Capital Gains, while SIP between July to December would be short term capital gains. The table below explains the calculation. I sell all units on December 28, 2017. What would be my Long Term and Short-Term Capital Gains/Loss? All SIP installments between January to December 2016 have completed at least 1 year of investment, so would qualify for Long Term Capital Gains, and there would be NO short-term capital gains. The table below explains the calculation. I had an emergency and head to sell units midway when the SIP was on. So, I sell all units available on June 3, 2016. What would be my Long Term and Short-Term Capital Gains/Loss? Many think that when SIP is running the units cannot be sold. This is NOT true. As we stated earlier, each SIP installment is like individual investment but automated. So, you can sell all units accumulated till date even while SIP is running. Like in the present scenario, we have accumulated 422 units from January to June. We can redeem all of it if required. As SIP installments between January to June 2016 have not completed 1 year of investment, so would qualify Short-term capital gains. There would be NO Long-term capital gains in this case. The table below explains the calculation. Once you are able to determine your losses as long term or short term the taxation is easy. Also Read: 3 Reasons Why Growth Option is better than Dividend Option in Equity Mutual Fund? Starting April 1, 2018 Long Term Capital Gains of more than Rs 1 Lakh would be taxed at the rate of 10.4% (including cess). This was introduced in Budget 2018. Until last financial year (FY 2016-17) the long-term capital gains from equity funds were tax free. The Short-Term Capital Gains are taxed at 15.6% (including cess). We would take the above three scenarios and calculate tax on the same. We calculate the taxes before and after FY 2018-19 as the rules changed from April 1, 2018. Long Term Capital Gains/Losses: If the redemption of mutual fund happens after 3 year of investment [Changed in Budget 2014], the gains or losses are classified as long term capital gains/losses in case of equity mutual fund. Short Term Capital Gains/Losses: If the redemption of mutual fund happens with-in 3 year of investment, the gains or losses are classified as short term capital gains/losses in case of equity mutual fund. For Debt Funds the tax calculation a bit more complicated as you need to consider indexation too. Long Term Capital Gains are taxed at the rate of 20.8% (including cess) after taking indexation benefit. The Short Term Capital Gains are added to the total income and taxed at the marginal income tax slabs. Also Read: How SWP in Debt Mutual Funds is better than Fixed Deposit for Regular Income? Each SIP installment for all practical purpose is like a fresh investment in mutual fund. So, on redemption the capital gains are calculated based on investment in each SIP installment. We hope the tax calculation examples above would have cleared the taxation on SIP in Mutual Funds. How to calculate ltcg tax on mf if holding period is more than 2 years? Do we have to consider 2 lacs as tax free(for two years). Scenario: I have purchased mf on 1 april 2018 and I am selling on 2 april 2020 and my profit is 2 lakh, so in this scenario do I have to pay any ltcg tax. We have explained this by an example in the post. Hi Mr. Amit, why should one pay any tax if Long Term capital gain is less than Rs. 1lac? In scenario 1 & 2 shouldn’t there be any tax on Long Term gains, right? This might not be the only long term capital gains for the person. So I have mentioned in case the LTCG is greater than 1 lakh!